It took longer in the making than I thought and required some help but in the end, I think it was worth the effort. 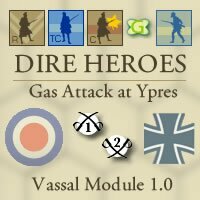 I am happy to announce the Dire Heroes – Gas Attack at Ypres Vassal module is now available. This module has the basic game set up as well as an advanced set up that is used in conjunction with the Dire Heroes bonus content. I hope to expand it soon with the help of my good friend, Bayernkini. We are working towards new scenarios and a Design Kit module that will allow players to use new units, terrain and rules. The Dire Heroes ruleset is required to play. 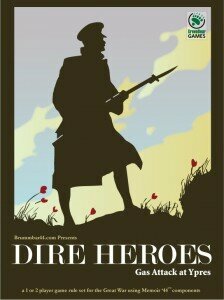 Fortunately MagCloud now offers PDF’s so you can get it for $5 from my page there – Dire Heroes. Now, if you order the print copy, MagCloud includes the PDF for free! You can find out more about the module by clicking on the help menu while the game is loaded and choosing the –Dire Heroes Info — item which will take you to this page – Dire Heroes Info. Oh, and it’s a Play by Email specific module so if you would like to battle, drop me a line! Just purchased this today… Sorry it took so long to get to it. Life has been busy with family and work commitments… but the good news is I have less than 7 weeks left of school. On my first browse through the rules it looks fun… Have you considered doing a print and play version? Thanks for your support! Hope you enjoy…and yes, I think the next version might actually be a print and play (new tiles, units etc…makes it hard to stick with the original M’44 stuff anymore). Be sure to let me know if you have any questions, I’m building an FAQ. Of course, if you want to try a game PBEM, drop me a line with the file! Happy Gaming!